American pop stars could learn a thing or two about endurance from Shreya Ghoshal. The Bollywood singer, one of the most prominent celebrities in India, didn't dangle from the ceiling during her Twin Cities debut Friday, switch in and out of costumes or engage in elaborate dance numbers. She simply sang. A lot. She worked the almost exclusively South Asian audience into a near frenzy at St.Paul's Ordway Center with one soundtrack favorite after another without once letting them see her sweat. Aside from a few numbers from an opening act and an intermission, Ghoshal was on stage for more than three hours. Concerts of that length may be customary in India, but here in the states, it's still an exception. 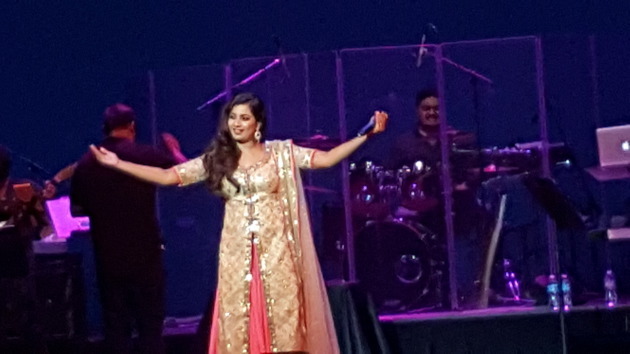 Ghoshal, who was kicking off a new tour, seemed genuinely surprised when fans from the back of the theater rushed forward to be as close asa they possibly could as she tackled hits like "Deewani Mastani" from "Bajirao Mastani" and "Yeh Ishq Hai" from "Jab Me Met," all in the high soprano of heroines from vintage Disney movies. "What is happening?" she said as the front of the stage quickly resembled a highway pileup. Of course, Ghoshal was a willing accomplice in creating the frenzy. She encouraged fans to clap on nearly every song and join in on the choruses. "Why are you singing so beautifully?" she said as the clock crept well past 11 p.m. "I have goosebumps all over me." It's a good bet that many in the crowd could say the same thing about her.